About 7,000 trucks are estimated to cross the Windsor-Detroit corridor every day, resulting in about 2.5 million trucks each year. DETROIT -- The groundbreaking for the Gordie Howe International Bridge took place Tuesday morning, signaing the beginning of an extensive construction project that will ultimately affect trade for a number of multinational industry partners, particularly automakers. 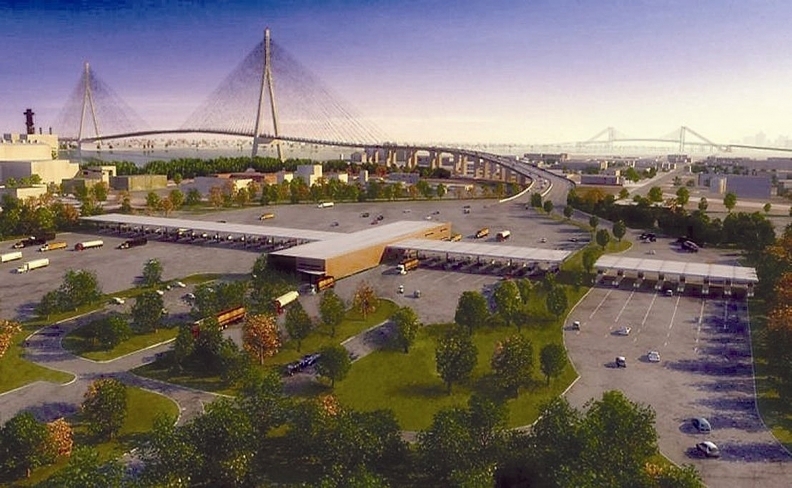 Once construction is complete, the bridge is expected to have serious implications for North American-Canadian trade, as the Windsor-Detroit trade corridor is the busiest commercial land border crossing, according to the Windsor-Detroit Bridge Authority, the federal corporation overseeing its construction. For more coverage from affiliate Crain's Detroit Business, click here. "Once in service, the new bridge will accelerate the flow of goods and services and provide a much-needed crossing alternative at the busiest Canada-U.S. commercial border crossing, creating thousands of jobs and opportunities on both sides of the border," according to the WDBA's website. But this project comes amid tensions between the U.S. and Canada following President Trump's recent steel and aluminum tariffs, and Canada's subsequent retaliatory tariffs, just as North American Free Trade Agreement renegotiations continue. Trump has since threatened a 25 per cent tariff on automotive imports. Trump's policies went into effect earlier this summer, jeopardizing the trade relationship between the two countries. If further sanctions are placed, automakers could face challenges, regardless of the bridge's intents to aid international relations and quicken the flow of auto parts across the border. Overall, more than 25 per cent of goods traded between the two countries moves across the nearly 90-year-old, privately-owned Ambassador Bridge. At the micro-level, 7,000 trucks are estimated to cross the Windsor-Detroit corridor every day, the WDBA says, resulting in about 2.5 million trucks each year. The WDBA says this represented over US$106.5 billion in bilateral trade in 2017. U.S. Census Bureau data indicates Michigan exported US$24.8 billion and imported US$47.4 billion to Canada last year. The project's groundbreaking was celebrated in the Delray neighborhood of Detroit after years of legal battles and uncertainty that the project would ever get off the ground. Parts of Delray has been dismantled and parcels of land cleared for the bridge's stateside international port of entry. A similar groundbreaking is planned for the fall in Windsor, where the Canadian government has spent millions of dollars reworking roadways to connect with its future port of entry. Gov. Rick Snyder and Canada's infrastructure minister Amarjeet Sohi attended the event. While prep work has been ongoing on both sides, Tuesday's event "marks the next step" for the project, according to a media advisory. The bridge is expected to cost nearly US$4 billion to construct and be complete by 2022 or 2023. If all goes according to plan, the landmark project will result in the largest cable-stayed bridge in North America, with towers rivalling the height of the Renaissance Center. A consortium of primarily Canadian companies was selected earlier this month to build the bridge, which will be financed and operated through a Canadian public-private partnership. Canada will own half the bridge, and the U.S. will own the other half. The Detroit-Windsor border is the busiest crossing between the United States and Canada. While public officials on both sides of the border have rallied for the bridge as a critical piece of infrastructure, the Moroun family, which owns the existing Ambassador Bridge, has done everything in its power to block its construction and maintain its monopoly on border crossings. Years of lawsuits and stalling appear to be nearing an end, but the Morouns have not given up. The family's Detroit International Bridge Co. launched a television ad in June appealing to President Donald Trump to revoke a permit for its construction. Assuming the project doesn't hit another political wall, the bridge will span 1.5 miles with three Canada-bound lanes and three U.S. bound lanes, along with a dedicated multiuse path for pedestrians and cyclists, according to the WDBA. As far as impact on the U.S. side, the port will stretch 167 acres and include inbound and outbound inspection of commercial and passenger vehicles. The Michigan Department of Transportation has acquired 90 per cent of land on the U.S. side on which the sprawling port will be constructed. However, it remains locked in an eminent domain battle with Moroun-owned entities for key parcels in Delray. In addition to the port, enhancements will be made to local roadways to loop the bridge into the grid. Four new vehicle bridges and five new pedestrian bridges are being planned, as well as widened roads and a reconfiguration of I-75 interchange ramps and service drives.